A woman in Can Gio outlying district of Ho Chi Minh City was saved last weekend thanks to Viber which surgeons in local infirmary used to send ECG result to their peers in Nguyen Tri Phuong Hospital for seeking professional assistance. Physicians in Nguyen Tri Phuong hospital read the ECG result and then provided consultation to their peers in Can Gio District hospital through Viber to save the local woman who was suffering coronary thrombosis. The 58-year-old woman was rushed to the Can Gio infirmary on March 31 with chest pain, vomiting and she was falling into coma. She was diagnosed with coronary thrombosis in the critical condition because her blood pressure was measured 80/60mmHg, heartbeat 40 times per minute and the ECG result pointed out that the woman was having heart attack. Soon, surgeons in Can Gio sent ECG result to their peers in Nguyen Tri Phuong hospital through Viber who were available for consultation. First –aid was applied to the woman before transferring her to Nguyen Tri Phuong Hospital. Surgeons of Nguyen Tri Phuong Hospital still kept an eye on the case via Viber on the way. 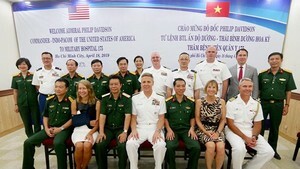 Head of the Heart Division of Nguyen Tri Phuong Hospital Dr. Le Cao Phuong Duy said that the woman was taken to the hospital on the same day when she was having low blood pressure and taking Beta blockers. The woman is in stable condition now.